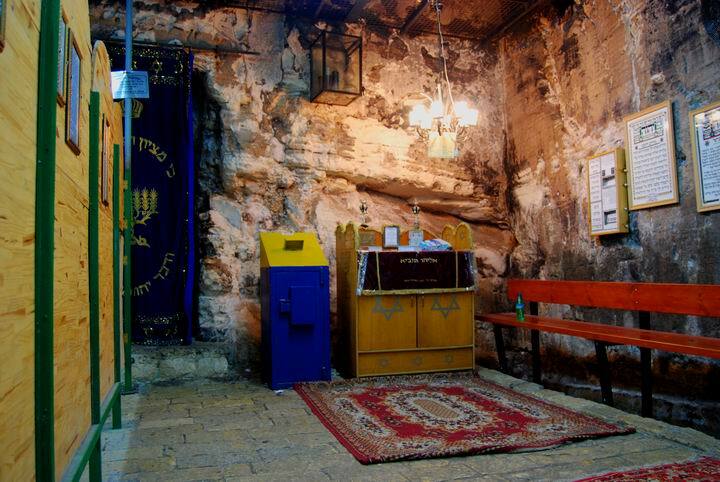 One of the most sacred caves in the Holy Land. According to all faiths, this site was named after the prophet Elijah who was based in mount Carmel, lived and hid here. 1 Kings 18:42: "...And Elijah went up to the top of Carmel; and he cast himself down upon the earth, and put his face between his knees"
Elijah's cave is one of the most sacred caves in the Holy Land. 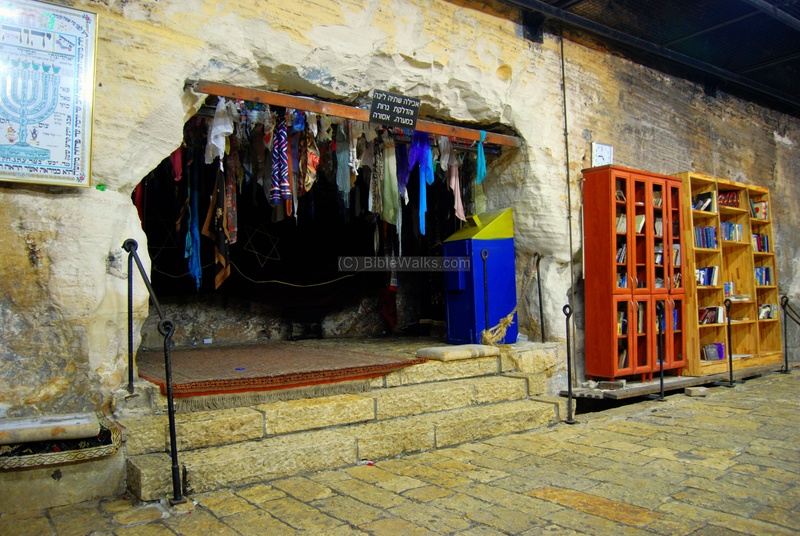 According to the tradition of all faiths (Jews, Christians, Muslims and Druze) it was one of the places where Prophet Elijah has lived and hid while operating in the area of Mount Carmel 29 centuries ago. Visitors come here to pray daily, and there are large ceremonies held several times a year. This natural cave is a long single hall (14 x 8 x 5M), with small cavities in its eastern and northern sides. Around the entrance to the cave are several buildings, built 120 years ago, which served as a hostel. The cave is located on the bottom of the foothill of the north-western corner of mount Carmel, just below the Stella Maris lighthouse and monastery. 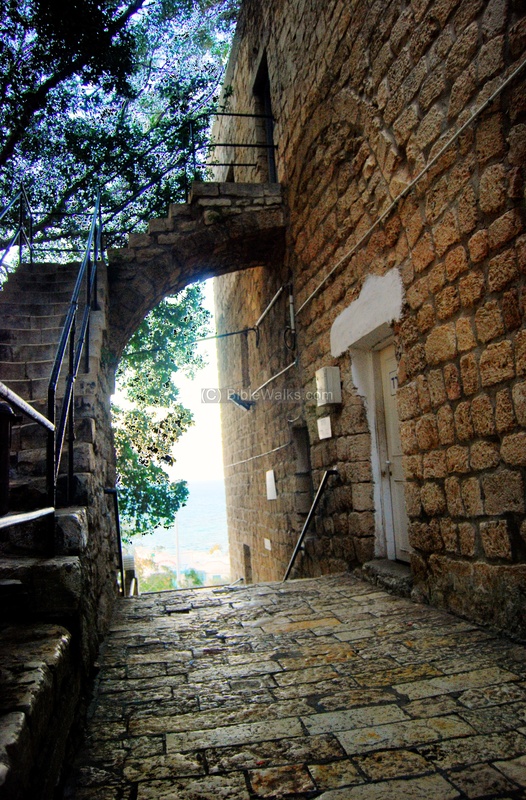 It can be easily approached by stairs from the Allenby Road (number 230), close to the location of the cable car station in Bat-Galim. 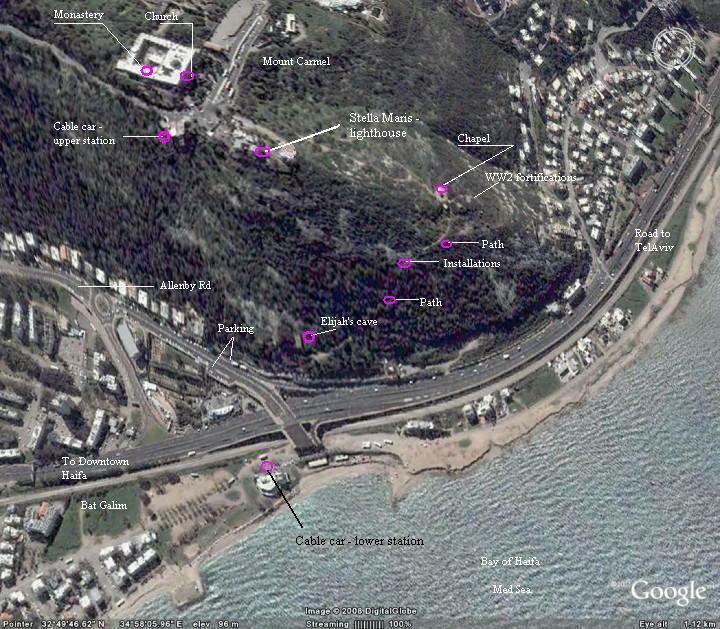 The following aerial view shows the location of the cave - in the center of the image. You can point on the purple points to navigate to the selected point - in this web page and in other pages. According to archaeological survey, the cave was part of a settlement in the Persian, Hellenistic, Roman/Byzantine, Crusaders and Mameluk periods. The pilgrimage to the cave started at these early times. The graffiti on the walls of the cave are dated to the Byzantine period. There are numerous of written records of the visits to the cave in the recent 1000 years. 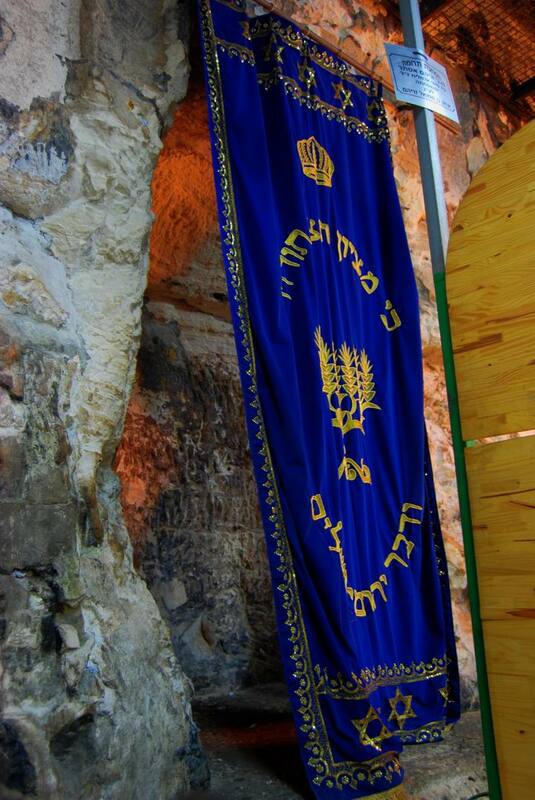 Note that there are a number of other caves around the Galilee, such as El-Khader, associated with this tradition. The Carmelites are a Catholic order of monks, one of the oldest in the Holy Land, and named after Mount Carmel. 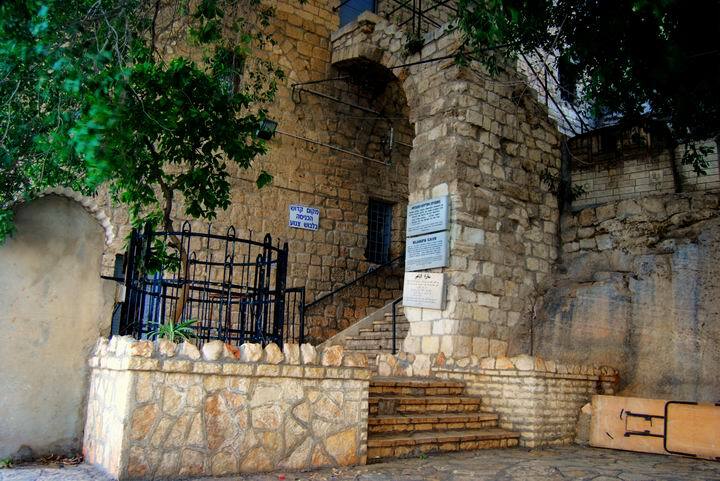 They were founded on Mount Carmel more than 800 years ago, starting from a number of Crusaders who went to seclusion in the caves on mount Carmel, and lead by the Frenchman Berthold (died 1188). In about 1200 their first church (St. Brocardus) was built in Siakh (bush) creek on the western slopes of mount Carmel, but were butchered by the Arabs after the defeat of the Crusaders. 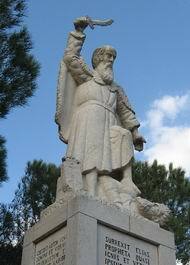 Their primary saint is the Prophet Elijah. During the mid 17th C the Carmelite monks returned to reside in the caves below Stella Maris and established a makeshift monastery between the cave and the lighthouse. The Carmelites established the Stella Maris monastery in the end of the 18th C, completing it in 1836, on the cliffs above the cave. This monastery became an influential institution in the newly founded city. It gave a push to the area, bring more Christian population to the city. The Carmelites, whose primary saint was Elijah, made the cave the most important Holy place in the area. Furthermore, the rediscovery of the Holy Land brought more visitors and pilgrims. Starting in 1887 a hostel was built around the cave to accommodate the growing number of visitors. Some of them came for several days and stayed in the rooms, such as sick people who came for the chance Elijah's spirit would heal them, or barren women who prayed for a child. The cave was controlled by an Arab family, and the site was called El-Hadar - Arabic name of the prophet. 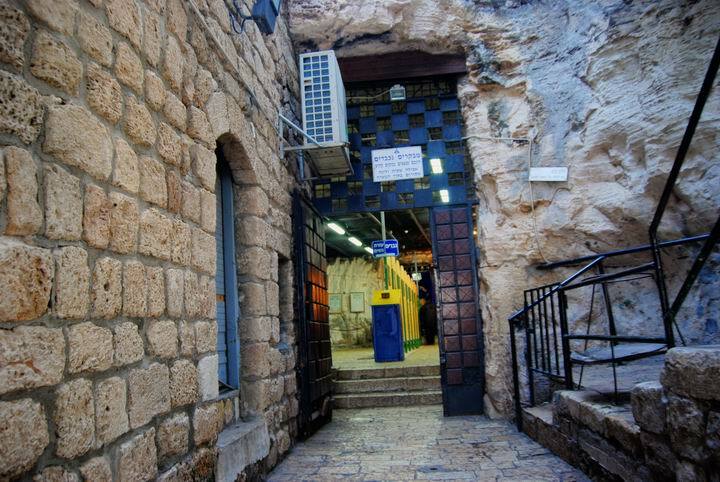 Today the cave is open to the public, controlled by the Ministry of Religious services, and is used for daily private prayers and year round larger events. An aerial view captured by a quadcopter drone is shown here, viewing the site from the North West side. The photo was captured at the height of 70m above the ground, close to the cable car lower station area. This is the yard in front of the entrance to the cave. Before the staircase is a stand for lighting up candles. The photo below shows the entrance that leads to the cave. The stair case above the pathway was used in the past to enter the upper rooms in the hostel, which accommodated the visiting pilgrims. The walkway leads to the entrance to the cave. Behind the door are two separated sides - for males on the right side, and for females on the left side. The right wing is for the male visitors, who come to pray in the cave. 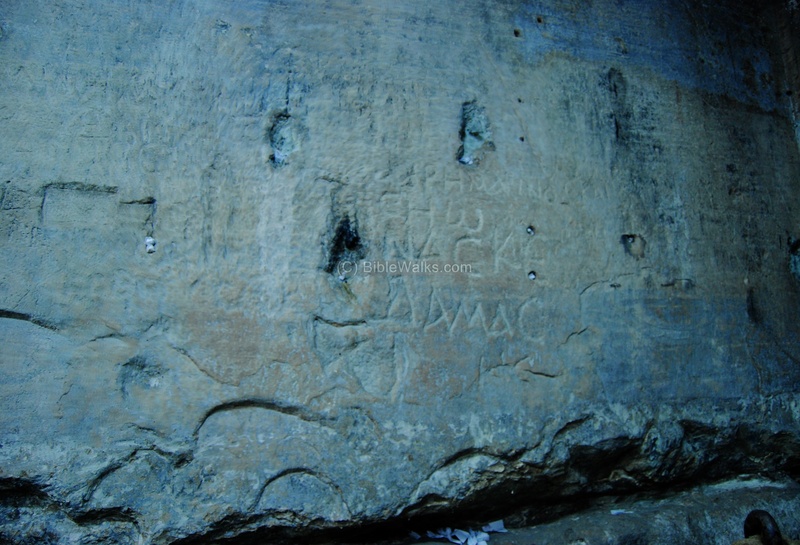 On the walls are hundreds of carved inscriptions of visitors, such as the Greek inscriptions seen in the photo below. The earlier inscriptions are from the Byzantine period. The left wing is used by the female visitors. There is a small cavity in the center of the wall. From its ceiling hang dozens of pieces of clothes, a custom in holy places. In the center of the eastern wall, shared by both wings, is a hidden cavity. Here a person can pray in solitude. This is the text on Elijah the prophet and the slaughter of the Baal prophets. King Ahab contested the prophet against his false prophets, and Elijah -with the help of the true God - prevailed. The traditional site of the contest is Keren Carmel on the other (east) side of the mountain. 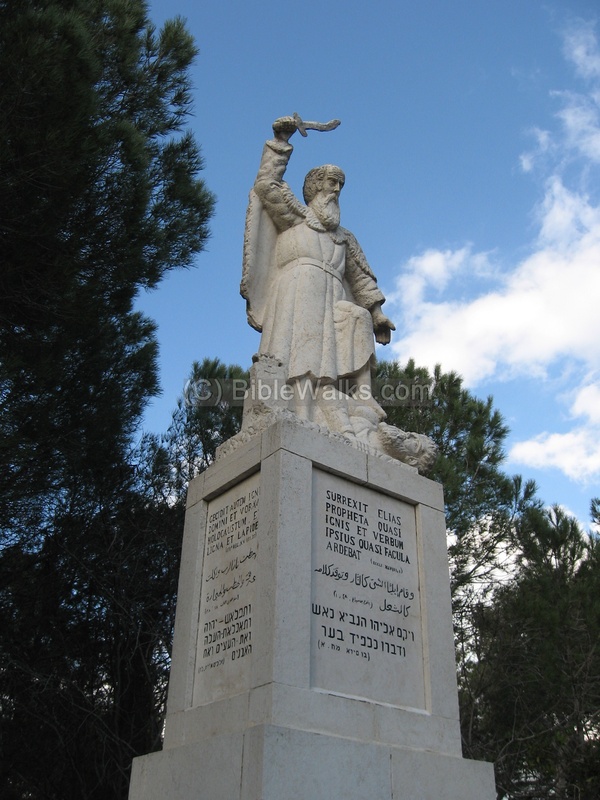 "...And Elijah went up to the top of Carmel; and he cast himself down upon the earth, and put his face between his knees"
This text describes the healing miracle of Elijah in Zarephath, near Zidon, where he revived a sick child. For this reason, both sick people and barren women come here in hope their prayers to the prophet will also grant their wishes. "And it came to pass after these things, that the son of the woman, the mistress of the house, fell sick; and his sickness was so sore, that there was no breath left in him. And she said unto Elijah, What have I to do with thee, O thou man of God? art thou come unto me to call my sin to remembrance, and to slay my son? And he said unto her, Give me thy son. And he took him out of her bosom, and carried him up into a loft, where he abode, and laid him upon his own bed. And he cried unto the LORD, and said, O LORD my God, hast thou also brought evil upon the widow with whom I sojourn, by slaying her son? And he stretched himself upon the child three times, and cried unto the LORD, and said, O LORD my God, I pray thee, let this child's soul come into him again. And the LORD heard the voice of Elijah; and the soul of the child came into him again, and he revived. And Elijah took the child, and brought him down out of the chamber into the house, and delivered him unto his mother: and Elijah said, See, thy son liveth. And the woman said to Elijah, Now by this I know that thou art a man of God, and that the word of the LORD in thy mouth is truth". El-Khader - Elijah's name in Arabic (means the 'green', implying being "fresh"). See other sites of Elijah in our info page.